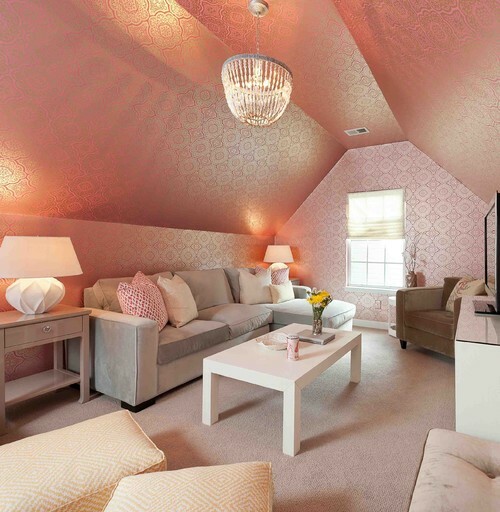 Home » Decor & Design » Ceilings & Walls » Wallpaper – It’s on a Roll! But just to play it safe, I like to use wallpaper in small areas, and as an accent. This way, should I ever (and I will) want to change the look, I can do so without spending days on the removal. In fact, as long as a good quality paper is used, removing a current wallpaper should be significantly easier than wallpapers of old. But let’s take a look at a few ways that wallpaper can be used (sparingly) to create a design statement. An easy way to add a finishing touch to your built ins is to wallpaper the backs. I really love the way that this home owner showcases this feature without being drastic. A nice monotoned wallpaper adds a bit of texture without overwhelming the decor and ornamentations that are displayed here. Because this is such a small area to work with, wallpapering can be done in no time, and removal should be almost as quick. Transitional Kitchen by South Pasadena Interior Designers & Decorators Charmean Neithart Interiors, LLC. 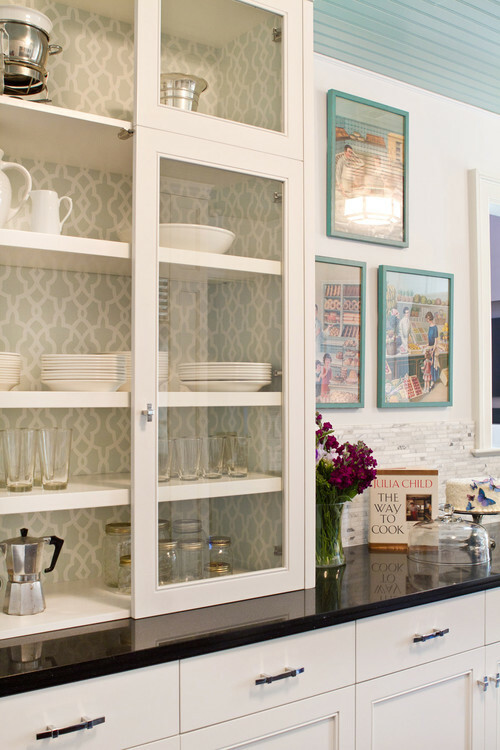 Another place that wallpaper works well in is a pantry. It is a good area for a first time wallpaper DIYer. 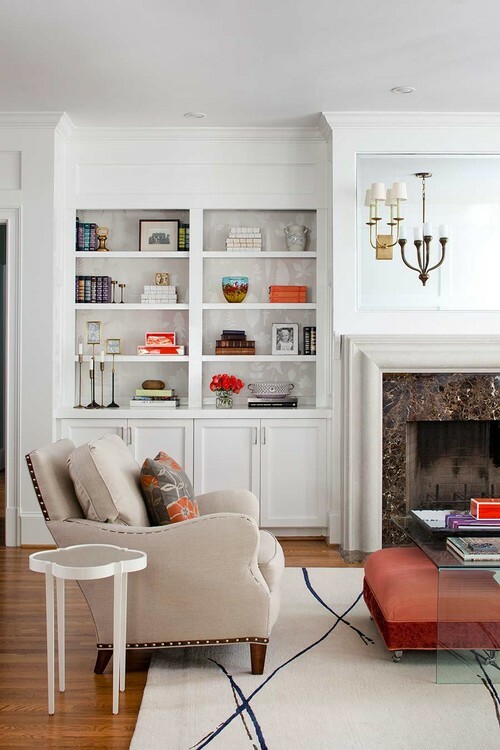 Because the shelves are essentially dividing the wall into small sections, you would only have to work with strips of wallpaper that are between 12″ – 24″ in length. Just about anyone can handle a wallpaper job like this. 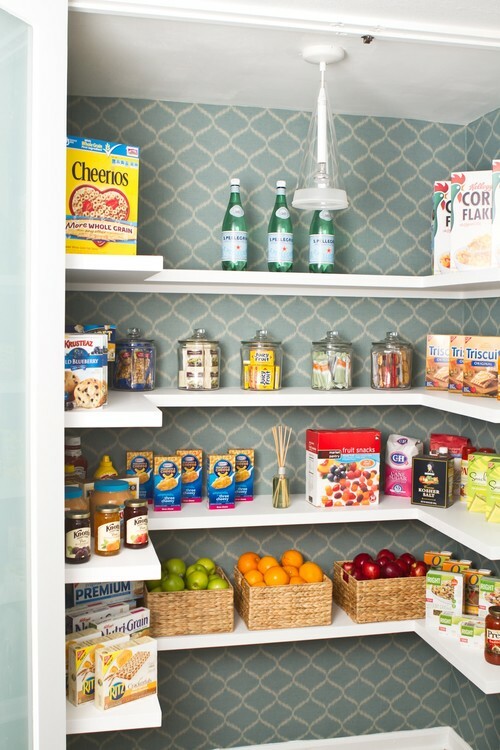 Plus odds are, you would end up with the nicest pantry on the block. Traditional Kitchen by South Pasadena Interior Designers & Decorators Charmean Neithart Interiors, LLC. Following the same logic, the correct wallpaper can attract attention to a beautiful set of glass cabinets. Again, I am showing something in a neutral tone, but the there is nothing that says that a bold splash of color wouldn’t work just as well. That’s the good thing about wallpaper, you can really use it to show your personality. 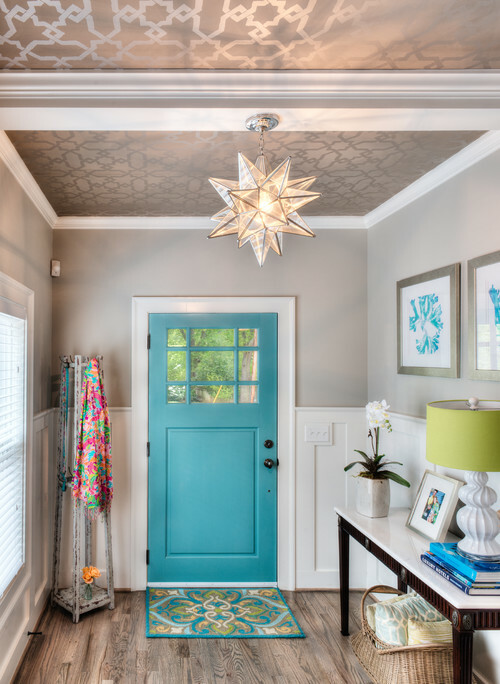 If you have any shadow molding around your house, it can be a perfect place to add some wallpaper. 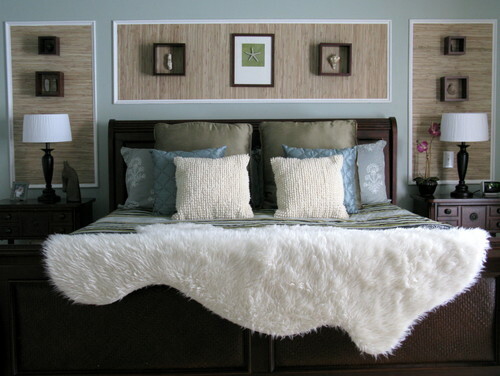 Here, a modern grasscloth wallpaper is used as accenting on the wall behind the bed. Wallpaper also makes nice wall art. Just by adding some trim to a wallpapered section, it has the ability to both dress up and define a space – as seen in the dedicated work space. This one I thought was quite unique. I am not sure that this would be a good idea if there are children who would be running up and down the stairs, but not everyone has children. I do, so this is out for me, but I still think it is something that some viewers may be inspired by. If your inclined to be a little bit braver than the above examples, then a recessed desk wall is the perfect place to accent with wallpaper. Not only will it create a designer finish to your work space, but it also will provide you with a view of something other than a plain solid wall. (Tip: make sure the wallpaper does not stress your eyes from a close up view). 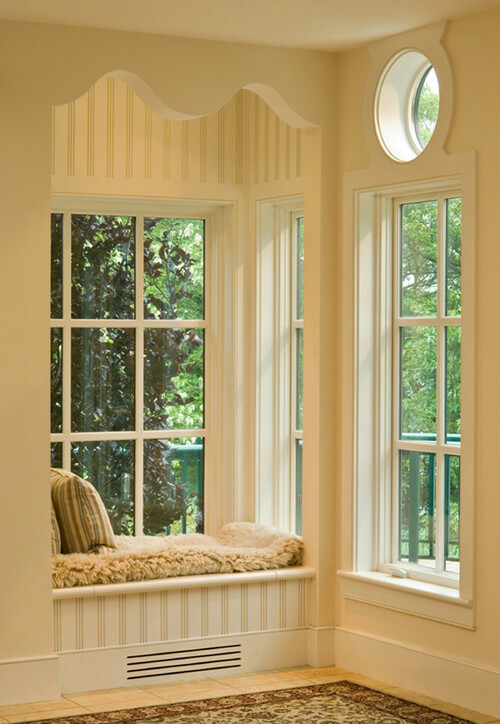 Do you have a recessed window seat, reading nook, or bench in your home? 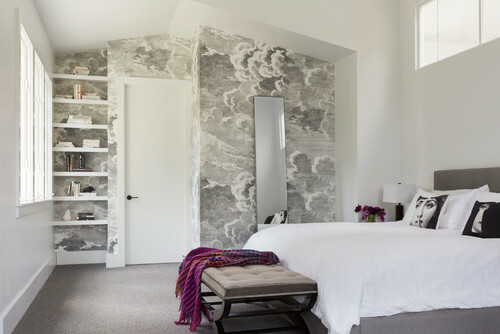 Wallpaper can help to create a relaxing space while accenting the architectural features of these areas. Just little touches like this can go a long way at giving your home a professionally designed look. 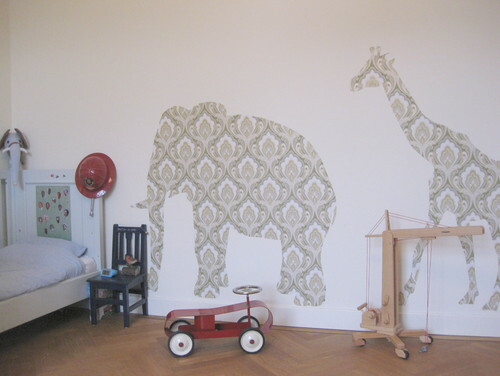 If you have little ones, wallpaper is great for creating texture in bedrooms. I like the way that the animals have been done in wallpaper here. It is unique, looks professionally done, and the best part, all you need to be able to do is sketch the outline of the animal. If you have ever tried to draw the actual thing on a wall, you can appreciate this ingenious idea for eliminating that aspect. For those of you that are willing to go a little further with the wallpaper, an entire accent wall can be quite beautiful. You still have not committed to a major project, but you reap all the benefits. Moving even a step further on the difficulty scale, wallpaper can be used to finish the top half of a board and batten wall. You can see that newer papers can look quite elegant when used in this fashion. I especially like them in bathrooms. It’s a small room, so it takes less time and money. Plus, pulling this down later will be much easier in such a small room. Finally, I am closing out with a wallpapered hallway. 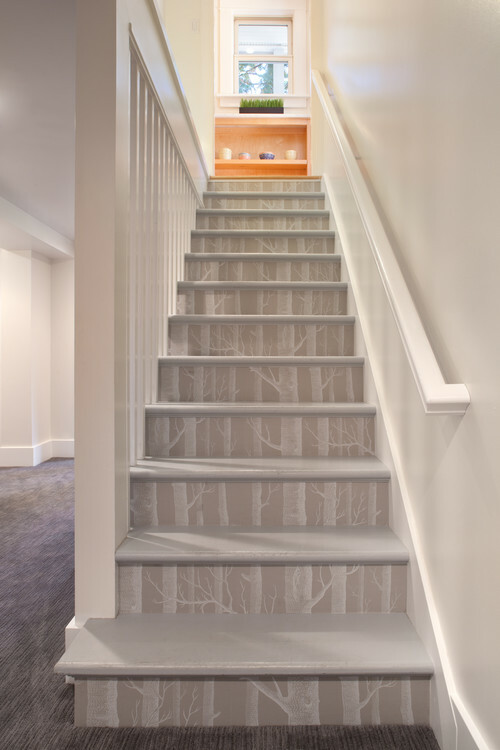 Since hallways are generally the overlooked area of design, wallpaper can really bring some much needed attention to them. This may be a big space, depending on what your house looks like. So if an entire hallway seems to much trouble for you, maybe consider just wallpapering the end wall. These are just a few of the areas that I thought would make good choices for those of you that may be on the fence about using wallpaper. By choosing a small space, you can feel more comfortable in the fact that changing it out will not be a major feat in the event that you don’t like the results. 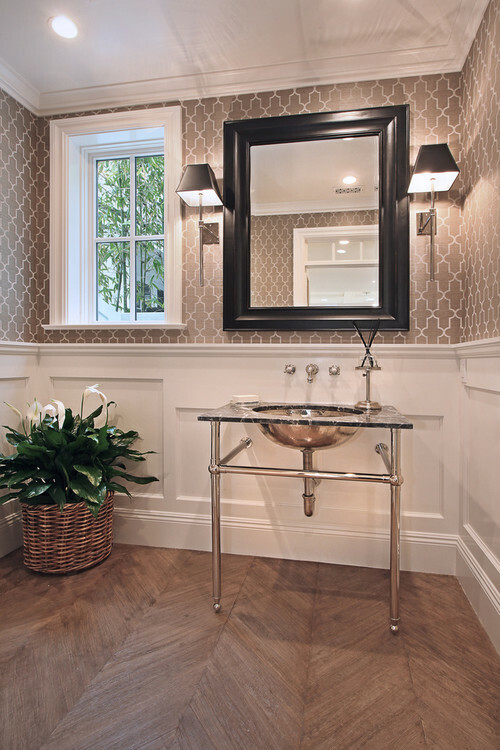 Other rooms that I favor for using wallpaper are the laundry room, bathrooms, mud rooms, and entry. However, like all things in life, too much of a good thing can make you sick. So, if you would like to try it in your home, pick out a space where accenting would increase the overall design appeal, choose your paper carefully (with smaller spaces, you may be able to afford a higher quality paper), and take care to apply the wallpaper neatly.